Stasis is difficult to capture cinematically. After all, stasis implies a state of inactivity and movies are about drama and drama typically implies a series of events each one requiring, as any ex-student of Robert McKee can tell you, a fundamental change. But in “Private Life”, writer/director Tamara Jenkins, borrowing heavily from her own life, has movingly brought stasis to the big screen, or the little screen, since “Private Life” is a Netflix production. That is not to suggest nothing, as they say, happens; plenty happens. 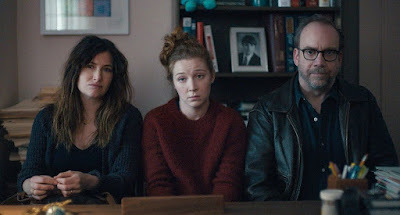 Its principal characters, Rachel (Kathryn Hahn) and Richard (Paul Giamatti), are in the throes of trying to have a baby by any means necessary. Yet if the plot can feel busy, packed with trips to the doctor and burgeoning familial drama when Richard’s niece, Sadie (Kayli Carter), comes to stay on their couch, the preeminent sensation nevertheless remains inertia. Even when prototypical dramatic routes are dangled, Jenkins refuses to follow them, creating a cinematic experience as stasis, showing people stuck in the same routine even as they fail to be present in their own lives, life lived as a tunnel where the light at the end isn’t brightening but dimming even as you inexorably move toward it in spite of yourself. Jenkins sets the mood by opening with a shot of Rachel stretched out across her bed and seen from behind, placing her derriere on full display. If it suggests the opening image of “Lost In Translation”, any romantic notions are swiftly squashed when we realize she has assumed this position merely so Richard can give her a hormone injection. Indeed, Jenkins is not starting from the beginning but dropping us right into the middle, long after the initial joy of their decision to have a child must have passed leaving only agony and exhaustion, reducing the miracle of childbirth to an endless series of waiting rooms and scientific alternatives to the scientific alternatives that did not already work. The pent-up performances of Hahn and Giamatti only exacerbate this mood, their characters suffering but never getting a handle on what they’re going through, generally coming across checked out on the entire ordeal, as if they are just slogging through what they see as their earthly duty. One extended conversation on a sidewalk finds Richard repeatedly trying to comfort Rachel in an embrace only to have her slap his hands away, over and over, and the smothered hostility is so palpable that I kept thinking the extras on the sidewalk, half-looking as they pass by, might not have been extras at all but unsuspecting passerby in a guerilla operation, underscoring the scene’s stormy meshing of private and public life. It’s a story that comes to feel as if it can only be resolved by a bomb, and so it is, sort of, when Sadie’s parallel story of leaving college just a semester short of graduating and taking a crack, or thereabouts, at school-free life in New York eventually converges with Rachel and Richard. Her writing dreams are a reflection of her new caretakers, their own lives as artists, or one-time artists in the case of Richard, emblemized in books covering the apartment from floor to ceiling, which almost seems to partly imprison them, suggesting a past life flung aside in the name of so many pregnancy attempts. 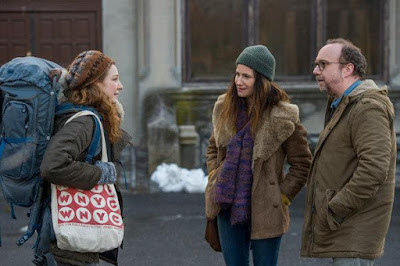 Rather, however, than Sadie initiating a remembrance of their old lives and reinvigorating their current ones, she furthers their stasis by taking a job at Richard’s artisanal pickle company, which Giamatti invest with nothing more than somber duty, and agreeing to donate an egg to their cause. And though this causes the trio to coalesce into something like their own family, that idea, like all other ones, becomes narratively stuck. If Rachel’s body is put through so much, so eventually is Sadie’s, a physical shattering of youth’s invincibility, her grand gesture falling flat through no fault of her own yet fostering emotional scar tissue you can see in Carter’s initially blithe performance gradually showing cracks of anxiety. For all the accruing melancholy, Jenkins nevertheless opts for a partly sunny conclusion, allowing space for rays of hope to filter in despite the narrative ellipsis. Then again, “Private Life’s” disinterest in traditional resolution is also what yields an overlong sensation, as if Jenkins is searching for some type of wrap-up, glomming onto different ideas, and just keeps going. In that way, the ending is a proper spirit animal, a sequence alluding to an earlier one, suggesting that the film has come full circle only to then transform that circle into a continuous loop, keeping right on going into the closing credits, suggesting ennui as infinite.